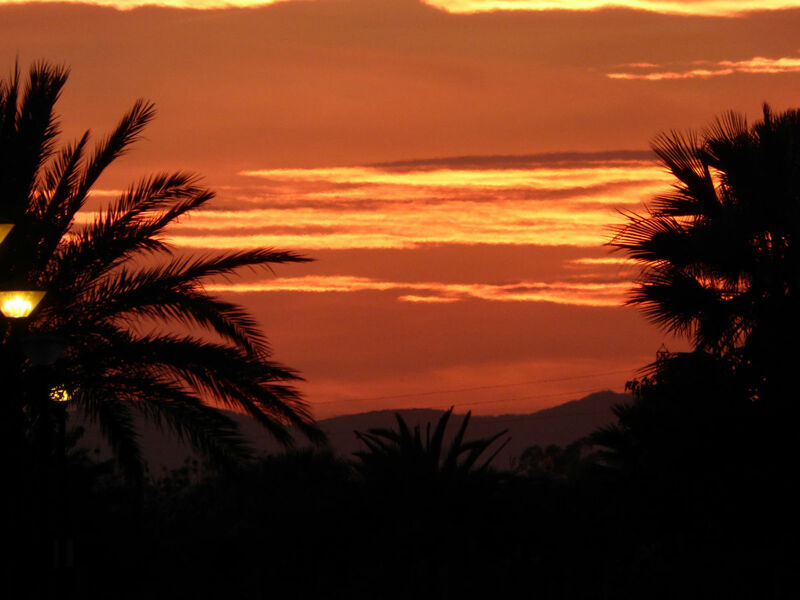 We’re in our fourth week at Marjal Costa Blanca and we’ve just arranged to stay a little longer. It’s obvious that we like it here even though we’ve had a temporary blip in the usually wonderful climate. We had almost 36 hours of heavy rain a couple of days ago and now the temperature has plummeted. First thing in the mornings it’s only 10 or 12c outside but thanks to the super efficient systems in the van we are cosy warm. We’re still getting pleasant afternoons but not enough to sit outside in a T shirt. We’re told this is all going to change in a few days and the warm sunshine is coming back. Hooray! I can almost see our friends and family in Scotland rolling their eyes and sighing. We’ve heard it’s really cold there. Sorry folks. Standing still is very different to touring. We have a routine that involves loads of activity and we’re feeling pretty fit and energetic. Touring necessarily involves a fair bit of sitting down and even though we walk the dogs daily, the amount of energy we use is small compared to life here, where all kinds of activities are available every day. We cycle everywhere, play Padel three times a week, swim, run a bit and walk a lot. The C&CC rally has finally begun and our quiet corner is gradually filling up with caravans and motorhomes. The rally meeting room is open and a whole lot of other events are being offered. Last night they were line dancing – more dangerous than you might think, especially if there is one person who has a poor grasp of right and left. Perhaps it was fortunate that we didn’t make the line dancing – we were in the site bar with our friends Val and Steph listening to live music and even risking a bit of a bop. There was no need to be self conscious because the Dutch were out in force and they are crazy on the dance floor. Watching them was almost as entertaining as the stage show. So I must report on our progress on the Padel court. Carlos, the member of the animation team that comes out to teach and play with us twice a week, has become our favourite person on the site. He has responsibility for a whole range of activities including zumba, aqua aerobics, latin dance, gym training and on top of that he’s in the dance team for entertainment. Yesterday he freely admitted that he was exhausted but he still threw himself into the game with totally camp gusto, throwing poses and dissolving into fits of giggles. For an hour he played against us both, the two of us on one side and him playing alone on the other. He insists that we score in Spanish and that we learn a few Spanish words each time we play. At the end of the hour when he won 13 games to our 7 he taught us a new phrase – “Mas y mejor” (More and better). We took that to mean that we’re improving but progress is slow. At one point during the game I completely lost concentration and instead of hitting the ball back when he served I tried to catch it. He doesn’t have a lot of English so I just said “Sorry, I was sleeping.” This sent him into a fit of helpless laughter, leaning against the perspex wall at the back of the court with tears pouring down his face. If you’re curious, here’s a video of people playing padel. Just to be clear – our game bears almost no resemblance to the film. As we left the court I said that I thought it was going to rain. This inspired Carlos to burst into a rendering of ‘It’s raining men, Halleluia!’ complete with a dance routine, then he was off to his next class, giggling all the way. I mentioned in a previous post that every morning we run the dogs alongside the bikes. They have a walk first thing to empty their tanks and socialise with some of the other dogs on the site then we put on their harnesses and attach them to the bikes for a run. This is a highlight of Boo’s day and as soon as he sees the harness he starts to quiver with excitement and letting out little yelps whilst jumping up and down. He is almost seven, making his approximate age in human years about fifty, so his energy is pretty impressive. Poppy is less excited, being a free spirit who would rather run after rabbits than be constrained by my bike. The other day we had a near disaster simply because we didn’t take into account the extent to which dogs learn routines. We usually take the same route, sometimes extending it a bit but always running on the same roads on the site. On our way back up the road yesterday Shirley called out that she was going to vary the route a bit and went to turn left. Boo went straight on and to my horror, following along behind, I saw him heading under her front wheel while Shirley swerved violently to try to avoid running him over causing her to fall off her bike. I had Poppy attached to my bike so I had to stand it up and get her to wait before I could run over to help. Shirley wasn’t hurt but she was convinced she had mortally wounded Boo who was stuck under her bike struggling to move. When I got to him I discovered that his harness had turned inside out and was stuck over his head making it impossible for him to walk because it was pulled so tightly across his front legs. Once we got him untangled he went and stood by the bike waiting to set off again, apparently completely unharmed. Shirley walked with him for a bit but he was keen to get running so we cycled back to the van feeling very shaken. We need to teach the dogs some simple commands for left and right if we’re going to keep doing this. I’m glad to report that his little accident hasn’t put him off his morning run and he was as enthusiastic as ever the next morning. Poppy, on the other hand, was distinctly cautious – perhaps watching the accident was more scary than experiencing it. Yesterday we were invited to join Val and Steph for a wee trip to Quesada, a small town a few miles down the road for brunch and a wander round the shops. Val has a little dog called Karma so we piled into her car, four women and three dogs and set off on our jaunt. By the time we got there the midday sunshine was warming us nicely and we sat outside a pavement café and enjoyed a fine late breakfast. To our amazement we saw a woman who lives two streets away from us in Bathgate, walking down the road. By the time we had realised who she was she had walked by but a few minutes later she was back and the dogs were greeting her like a long lost friend. We felt so pleased to see her, even though we have only spoken to her in the street at home a handful of times. There was something quite special about the encounter. Our time here has given us space to think about a lot of things. Staying in one place for more than a month is a whole new experience and we’ve talked to a lot of people who do this every winter. Many of the people on the rally plan to stay until May, in fact we will be one of the first to move on next week. For us this ‘year out’ with only a month at home is an adventure. It’s a chance to experience all kinds of new places and meet new people. A strange reflective mood has settled over us now we only have just over a week left here. It’s good to be part of a community with shared interests and a genuine willingness to help each other and share resources. But it has become clear to us that this life is completely separate from the real world. We are in a gated community where security guards are on duty 24 hours a day. Registration numbers are electronically recognised at the gate and we’ve seen the security team refuse access to anyone who doesn’t have a registered number plate. Every couple of hours a van drives round the whole site checking that all is well and this happens day and night. We like the feeling of safety and security but we’re not sure that we could live like this all the time. Gated communities for older people are becoming more and more common. We received an email from the company that owns this site to say that they are considering building a permanent residential community for the over 55s and would we be interested? Right now the answer is no. We’re ready to move on, to be on the road again discovering places that are a bit out of the way and completely new to us. Having a motorhome makes it possibly for us to have the best of both worlds. The ability to stay a while and join in an organised rally and the freedom to choose to move on and explore places we’ve never been. We have a lot to be thankful for. Hope you leave some sun for us when you leave, we will be there this time next week. We are coming over on the 4th Dec for 10 days,hope the weather holds. It will certainly be warmer than here at the moment -2. What is the name of the town where the site is we will be doing some touring and my give it a visit. Glad you enjoyed the area, I think we have made a good choice and can’t wait to return. Our nearest town is Catral. It’s a small, typically Spanish town with a market on a Saturday. The site is just on the other side of the motorway from Catral. Hope you get loads of sunshine Duncan. We’re told it will warm up that week. Another slice of a different kind of life. If my partner would work less we could do some of this! Enjoy ladies! !